Lake Hadlock, also known as Hadlock Pond, is located in Fort Ann, NY in Washington County at the foothills of the Adirondacks just Southeast of Lake George. As part of the Adriondack Park, you will find it is a very clean lake refreshed by a mountain stream. Located on the southern end of the lake is the Hadlock Inn and Campground, a 20 site campground that was run by David Mulchay since 1974 until his passing in the winter of 2008. 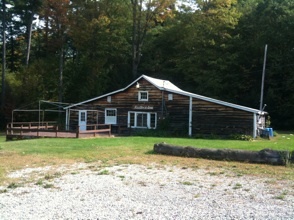 In the late Fall of 2010 the property was acquired by an new owner who intends to bring it back to life as it was in the past. Hadlock was created around 1896 from a pond known as Sunderland Pond when a dam was built to benefit hydroelectric station owned by The Adirondack Power and Light Corporation at Kanes Falls on Halfway Creek in Fort Ann, making the pond into a 220-acre lake. The commercial property next to the dam was also home to Green’s Pavilion in the 60’s and 70’s, which burned down. Hopefully it can be recreated soon. Anyone who has Old Photos of the historic pavilion are encouraged to share them with the new owner. Bookmark and check back here for more information as Lake Hadlock LLC makes the repairs to reopen the Lake Hadlock Inn and Campground. Suggestions and ideas are also welcome. The old Inn will be updated and open for business as soon as possible. The floors require some repair, so it will operate as an office in 2011. Sign up for the newsletter or twitter for updates or friend us on facebook below. The deck is open for lounging. Updated bathouse plans are being drawn up with repair to commence in the Fall of 2011 Existing buildings are freshly painted to support 2011 season campers. Huge sandy beach for sunbathing, swimming, and relaxing in the sun awaits you. Beach was raked for the first time since 2008 in May. Sunbathing encouraged. New Docks made of locally harvested Hemlock from Meads Lumber to be installed in the spring of 2011.